Zanuck began his career writing scripts for Rin Tin Tin as an employee for Warner Borthers, and ended up as the second most powerful man at the studio. In 1933, Zanuck left Warner Brothers and founded his own studio, 20th Century Fox. 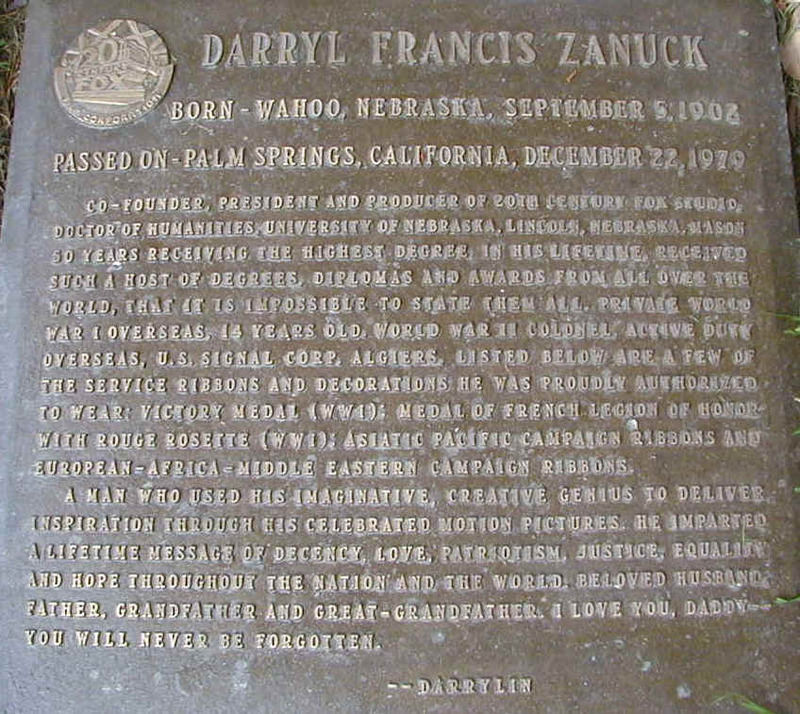 One of the kingpins of Hollywood's studio system, Zanuck was the offspring of the ill-fated marriage of the alcoholic night clerk in Wahoo, Nebraska's only hotel and the hotel owner's promiscuous daughter. Both parents had abandoned him by the time he was 13; at 15, he joined the U.S. Army, and he fought in Belgium in World War I. Mustered out, he kept himself alive with a series of desultory jobs -- steelworker, foreman in a garment factory, professional boxer -- while pursuing a career as a writer. For Warner Brothers, under his own name and three pseudonyms, he ground out as many as 19 scripts a year, and became head of production at age 23. In 1935, Twentieth absorbed a bankrupt giant, Fox: Zanuck ruled the combined studio for decades. He became known as the most "hands-on" of the major studio bosses, taking particular pride in his talent for remaking movies in the cutting room. Zanuck returned to run 20th Century-Fox; he promoted his son, Richard D. Zanuck, to head of production, then engineered his firing in a messy boardroom brawl. Within a few months, in May 1971, Zanuck himself was deposed: he was the last studio boss of his era to go down.